Home / Blog / Workers’ Compensation in New Jersey: How Do I Obtain It And When Do I Get Paid? Workers’ Compensation in New Jersey: How Do I Obtain It And When Do I Get Paid? The New Jersey Workers’ Compensation Law, N.J.S.A. 34:15-1 et seq., has been providing monetary and non-monetary benefits to those who have sustained work-related injuries or illnesses in the state of New Jersey since 1911. According to this law, if you have been injured or have fallen ill because of a work-related risk or complication while employed in New Jersey, you may be entitled to receive medical treatment, money for lost wages, and the dependents of that worker may be entitled to receive monetary survivor benefits if you or a loved one dies from their injuries or illness. So, if you or a loved one have been injured or contracted a disease while at work in the state of New Jersey, it is important to know how to obtain workers’ compensation benefits and how often you will receive benefits once you obtain them. According to the New Jersey Workers’ Compensation Law, all employers in New Jersey are required to have workers’ compensation insurance. This means that an employer must either acquire workers’ compensation insurance by purchasing a policy through a private insurance carrier or be approved by the state to be self-insured. Regardless of whether an employer purchases a workers’ compensation insurance policy or is self-insured, an injured or ill worker must notify his or her employer in writing to initiate a workers’ compensation claim. After receiving this written notice, the insurance company’s claim adjuster or the employer’s claim adjuster will investigate all facets of the claim, including reviewing the workers’ past medical records, the treatment plan and diagnosis created by the physician treating the injury or illness, the workers’ statements about the circumstances surrounding the injury or illness, and any witnesses’ statements about the circumstances surrounding the worker’s injury or illness. Based on this information, the adjuster will determine whether to accept or reject the workers’ compensation claim. If the insurance company or the self-insured employer accepts the claim, then the worker will receive workers’ compensation benefits in accordance with New Jersey law. However, if the claim is rejected, the injured or ill worker may file a formal Claim Petition or an Application for an Informal Hearing with the New Jersey Division of Workers’ Compensation. If the worker’s petition is successful or if the worker wins at the hearing, the worker will receive workers’ compensation benefits. Once a worker’s claim is approved by either the employer’s insurance or by the state, the worker is entitled to receive workers’ compensation benefits immediately. If the worker is only entitled to receive temporary disability benefits, then you can expect to wait approximately two weeks to receive your first compensation check. If you are entitled to receive permanent disability benefits or are awarded workers’ compensation benefits by a judge, then the employer’s insurance has 60 days to process the first payment. 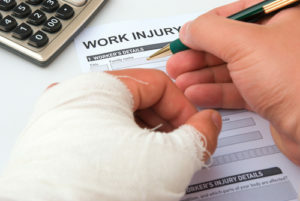 After processing the worker’s claim, a worker should generally receive workers’ compensation checks in the same frequency with which he or she received his or her paycheck. Accordingly, if you were paid bi-monthly by your employer prior to your injury or illness, then you will likely receive workers’ compensation checks on a bi-monthly basis. In the event that the employer’s insurance company fails to process a worker’s claim within a reasonable time period, then the worker may be entitled to penalty payments in addition to his or her compensation payments. If you fail to receive workers’ compensation payments that you are entitled to, it is best to contact a workers’ compensation attorney about your claim. A workplace injury can be devastating, particularly if it prevents you from returning to work for an extended period of time. Although New Jersey Workers’ Compensation laws are supposed to provide you with reimbursement for medical expenses and replacement pay for missed time at work, it is not always easy to get the Workers’ Comp benefits you deserve. That is why you should speak with a knowledgeable Workers’ Compensation lawyer about your situation and get guidance throughout the claims process. The experienced Workers’ Compensation attorneys at Lombardi and Lombardi, P.A. represent clients in Freehold, Perth Amboy, Piscataway, Woodbridge, and all across New Jersey. Call (732) 906-1500 or email us to schedule a free consultation about your case. We have an office conveniently located at 1862 Oak Tree Road, Edison, NJ 08820, as well as offices in Edison, Brick, Freehold, Point Pleasant Beach.